Investment remains stuck at its lowest level and the economy is not taking off. It is unable to transcend the cycle and culture of pervasive pessimism, as if something is binding and immobilising it. Wherever one may turn, from discussions with businessmen and bankers to academics and other citizens, one is confronted with the same question: When will elections be held? It is at once an anxious and reasonable question which is rooted in the patently obvious stagnation and the low expectations in Greek society. After a ten-year crisis, a cloud of pessimism and fatalism is hovering over Greece. The “left-wing” government of Alexis Tsipras, despite any maturation and its many transformations, did not manage to inspire or create an environment that is suitable for creativity and progress. Most importantly, it was not able to exploit the unprecedented (in terms of its breadth and depth) fiscal adjustment and the conditions of trust that it might have established. Mr. Tsipras may invent ways and ruses to perpetually renew the political time left to him, as occurred recently with the Greece-FYROM Prespa Agreement, but he has proven unable to create an environment and atmosphere of high expectations for the country and its citizens. The politico-ideological fixations and convictions that bind him with his associates leave little room to hope for an economic rebirth of the country. Those in power have limited themselves exclusively to targeted, minor arrangements between economic interests. They lack vision and are unable to approach and mobilise those who can contribute to growth. They treat entrepreneurship with suspicion, view issues of production from a distance, and insist on schemes to redistribute poverty through over-taxation. That discourages, obstructs, and in the end shoos away from the country businesses and individuals who cannot endure sharing their toil and income with an ineffective and largely unjust state, which instead of offering incentives for effort and creativity punishes and destroys them. Their stubborn opposition to non-state universities is indicative. A prominent businessman recently noted in company that he cannot understand why Greece has steadfastly rejected over the last decades the founding of non-state universities, which all over the world are considered places of progress which mobilise resources and employ highly trained personnel. The prospective establishment of foreign-language, non-state universities would bring investment to the most advanced and secure country of the Southeastern Mediterranean. It would create technological and other ecosystems, stem the brain drain, and permit the return of those who fled the country for a better future during the years of the crisis. All countries do this. Many ask if the communist former president of Cyprus, Dimitris Christofias, could succeed at this, why can Mr. Tsipras not do it in Greece? They can find no logical answer or explanation, beyond his outdated politico-ideological fixations. Prominent bankers maintain that even under current conditions the economy can take off and create conditions for growth, as occurred in the post-war period. Labour costs receded dramatically, values reached rock bottom, the agents that support competitiveness were largely reviewed, and the country’s geopolitical position was bolstered by the clashes prevailing in the broader region. Despite all that, investment remained stuck at its lowest level and the economy is not taking off. It is unable to transcend the cycle and culture of pervasive pessimism, as if something is binding and immobilising it. Distinguished businessmen and bankers say that Mr. Tsipras has done whatever he was to do on the fiscal front, but has nothing more to offer. He does not have a culture of growth and does not believe that the private sector can bring an economic spring, because he thinks that only the state has such capabilities. Mr. Tsipras’ guide remains the old statist model of five-year plans with many stages and sectoral policies. That is what his ministers are saying and that is what he will present as the solution to the country’s economic problem in the forthcoming electoral campaign. By all accounts, this is an outdated model that is not implemented anywhere in the developed world and seems to be a remnant from the distant past. Based on these observations, there is a common conviction that Mr. Tsipras will leave behind an economy at the edge. His legacy will not be the best. There are projections of low growth in 2019 – less than two percent by all appearances. Banks are still struggling with non-performing loans and are unable to provide even basic funding for the private sector. The Public Power Corporation will be in bankruptcy due to its inability to limit energy costs. Taxes will remain very high and fiscal space will be quite limited. Insurance funds will continue struggling and all potential costs in the economy will be unfavourable, not leaving much room for development policies or essential interventions. Distinguished businessmen and bankers believe that even in these problematic conditions Kyriakos Mitsotakis and a forthcoming New Democracy government have the opportunity to present a contemporary and effective growth model which will be in line with contemporary international currents and will be able to change for the better the image of the economy and the country. They say that New Democracy’s leader knows the limitations, has a first-hand understanding of the reservations in the private sector, and believes deeply that only massive foreign investment can lead to a change of course and remove the economy from the quagmire of the memorandums and of pessimism. Mr. Mitsotakis is fully aligned with these prospects and privately concedes that only a strong international wave of development can change the course of the Greek economy. Indeed, he is working with a host of businessmen and experts to design an invasion of foreign capital that can save the Greek economy. 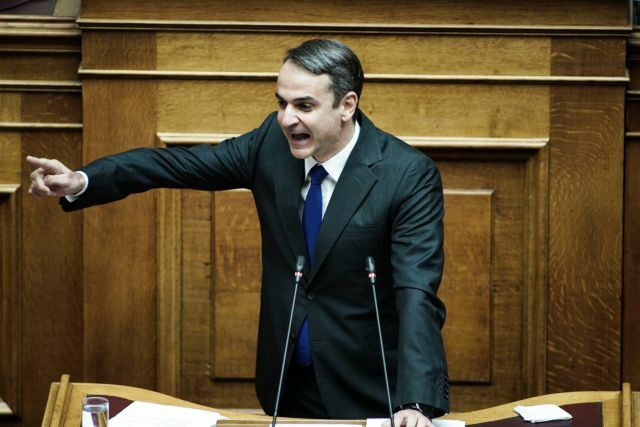 Mr. Mitsotakis’ interlocutors speak of a sweeping plan of foreign investment that can be supported by a long list of privatisations and by measures to swiftly free up large investments which draw international interest but have been “frozen”. The idea is for Mr. Mitsotakis to immediately prepare, present, and support a wave of international investments and growth initiatives, without hesitation or reservations, which would be bolstered by incentives and facilitating measures. The belief is that this way he will not only stand apart from his opponent, but will also be distinguished for shaping an atmosphere of expectations and hope. Those who espouse these ideas believe that Mr. Mitsotakis has the knowledge and experience to promote a dynamic plan to restart the Greek economy. They also believe that he is capable of leading such an effort by traveling around the world and guaranteeing that it will be completed so as to reincorporate Greece in the international investment map. It is said with a touch of hyperbole that if such a plan were unswervingly and precisely served it could allow the leader of New Democracy to announce one investment a day during his term of office. These observers insist that the preconditions for such a leap exist. They note that Mr. Mitsotakis is already choosing his associates and cadres from the market and business world in order to boldly serve such an ambitious plan. The supporters of this plan note that only by developing it can positive expectations be cultivated and transmitted to the electorate. The successful execution of the plan following the general election will have a multiplier effect that will sway the still inhibited domestic business class. Based on the above, many say that a Greek society beset by fatalism has an absolute need for a window of hope. Whoever opens it fully and truly will reap only benefits.